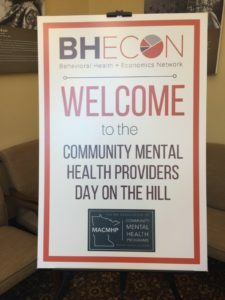 On May 3, the Minnesota Association of Community Mental Health Providers (MACMHP), in partnership with the Behavioral Health + Economics Network (BHECON), hosted its “Day on the Hill” at the state capitol building in St. Paul. About 30 people attended the event, which featured presentations by the National Council, USC Schaeffer Center for Health Policy & Economics, and American Public Media Group. The program was followed by a primer on conducting legislative, after which advocates called on their state legislators to voice support of the Mental Health Workforce Shortage bill, SF 3066. To set the stage for the day, attendees heard about the current policy landscape in Washington, DC related to mental health and addiction. In terms of program funding, behavioral health fared quite well. As part of the omnibus spending bill passed by Congress in March, about $10 billion was allocated for Certified Community Behavioral Health Clinics, the integration of primary and behavioral healthcare, Mental Health First Aid, state grants to address the opioid crisis, and other key programs. The downside has been the changes proposed by some states to the Medicaid program through the waiver process. New restrictions on eligibility such as work requirements, drug testing, higher cost-sharing, and time limits on coverage have the potential to adversely impact people with mental health and substance use disorders. Under the Centers for Medicare & Medicaid Services new guidelines, at least 10 states have submitted program waivers to require work, job training, job search, or community engagement activities to maintain eligibility for Medicaid. MACMHP has made addressing the workforce needs and career advancement in the mental health care field a top policy priority. Practical solutions such as establishing common baseline qualifications for non-licensed mental health practitioners and mental health rehabilitation workers, broadening the ways through which candidates may qualify for employment in community mental health care delivery, and offering additional career ladders for staff and retaining qualified staff would streamline and expand mental health program staffing. Data presented at the forum showed that about a third of Minnesotans reside in a behavioral healthcare professional shortage area, where the number psychiatrists, clinical psychologists, clinical social workers, psychiatric nurse specialists, and marriage & family therapists cannot meet the demand. In rural areas, of the state, there is one mental health provider for every 1,960 patients. This shortage is created in part due to the difficulty for non-licensed professionals to build a career due to restrictive educational and work experience requirements. “Change the mental health workforce requirements without sacrificing quality of care” was the message that attendees took to their state legislators during visits later that afternoon. 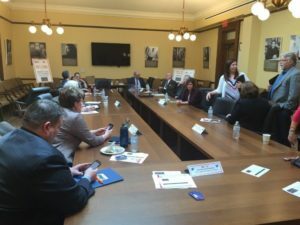 To help them better understand how to effectively deliver their message, they heard from seasoned advocates and lobbyists on how to conduct successful visits with legislators. The advent of Certified Community Behavioral Health Clinics (CCBHCs) in Minnesota has created a new opportunity to resolve behavioral workforce shortage issues and expand he delivery of services to those most in need. A highlight of the day’s program was the announcement of a new initiative developed by American Public Media (APM) and Minnesota Public Radio (MPR), “Call to Mind,” a five-year initiative to inform and mobilize conversations about mental health and expand focus on mental health coverage on-air and online. The aim of the initiative is twofold: activate and amplify public conversation by bringing people together and establishing a platform for change for individuals, communities, educators, employers and health care systems to inform policy discussions. APM is seeking to raise the visibility of mental health by producing stories that elevate the discussion around how we talk about mental health, how we care for mental illness, and how we fund mental health care and treatment. APM is seeking to capitalize on the interest in mental health that has been generated through celebrities’ and other public figures’ openness about their own mental health challenges through social media channels. To expand the focus on mental health coverage, MPR News will have a dedicated mental health reporter in place to increase both the volume and diversity of coverage. This expanded coverage will begin in the summer of 2018. It is the hope that “Call to Mind” will extend beyond current public radio listeners and engage new audiences with both live events and opportunities to participate online. During the month of May, MPR’s regional services will weave mental health-themed on-air programming and presence, digital activity and live events with local partnerships.